February 2019: The bookcase will have to move. Can you suggest anywhere in Penrith that could host this? Get in touch please! Freegle is a great way to hand on free items to someone else who wants it. But what about all those small things you no longer want? Meet the Freegle bookcase! This is inside the Devonshire Arcade in Penrith near the library entrance. Please put any small things you don't need for anyone to take on the outside of the bookcase eg books, DVDs or small toys. The bookcase is sometimes used as a drop off point for items you have promised to other Freeglers - Please put these on the back of the bookcase with a name clearly written on. Please don't seal completely, for safety's sake - they may need to be checked in an emergency! Also, please note that this is done entirely on trust so we can't guarantee that no-one else will take it. Update 9/12/16: the bookcase has now moved to the other side of the library entrance and there is less room for dropped off items. 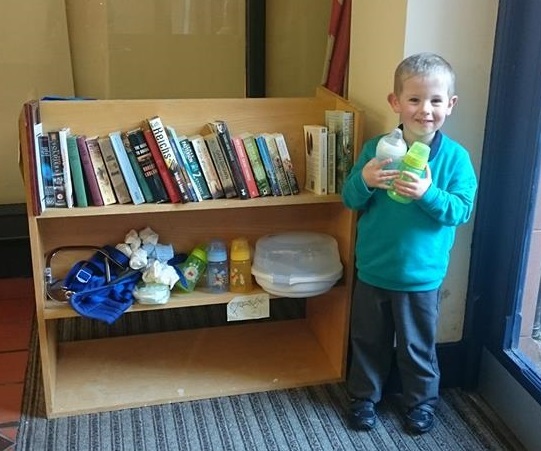 Local Freegler Helen Cooper says, "LOVE our Freegle bookcase - we have found it really handy to be able to pass on usable items using the bookcase and we have also managed to pick up a couple of books and tractor magazines for our little boy - which will be recycled back to the bookcase once finished ?. It is a fantastic idea ? ? “People seem to be using it as it was full of books when we put some on other day and today they had all gone. "It seems to have hit off in last few months - we saw people looking at shelf as we headed back to the car so good sign smile"